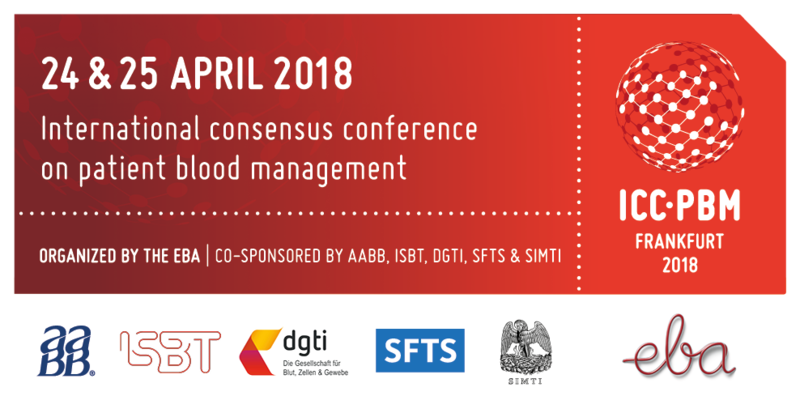 On 24 and 25 April 2018 the International Consensus Conference on Patient Blood Management (ICC-PBM2018) will take place in Frankfurt, Germany. 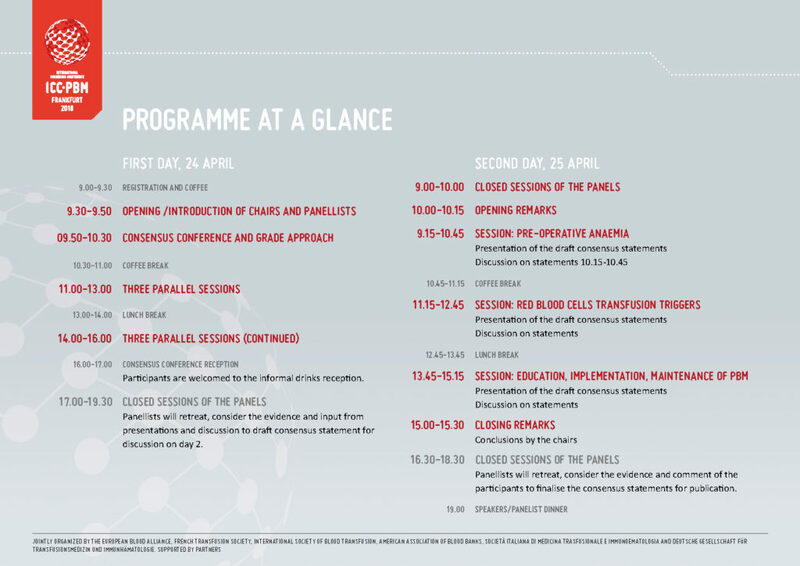 At this event, international experts will present evidence summaries to a multi-disciplinary panel and an audience of about 200 stakeholders, consolidating the available knowledge and concluding on recommendations. The Centre for Evidence-Based Practice (CEBaP) of the Belgian Red Cross followed a rigorous scientific process by systematically reviewing the available PBM literature, condensing these into evidence summaries using the GRADE Approach to assess the quality of the evidence. The Scientific Committee members have oversaw the work and checked all the summaries. Frankfurt is the largest city in the German state of Hessen and the fifth-largest city in Germany, with a population of 714,241 (2014) within its administrative boundaries. The urban area called Frankfurt Rhein-Main has a population of 2,221,910. The city is at the centre of the larger Frankfurt Rhine-Main Metropolitan Region which has a population of 5,500,000 and is Germany’s second-largest metropolitan region. This old imperial city on the River Main – hence its full name, Frankfurt am Main – is, by virtue of its central situation, the most important commercial and economic center on mainland Europe. Frankfurt is also a centre for commerce, culture, education, tourism and web traffic. Frankfurt is also home to many cultural and educational institutions including the Johann Wolfgang Goethe University and Frankfurt University of Applied Sciences, many museums (e.g. Städel, Naturmuseum Senckenberg, Schirn Kunsthalle Frankfurt, Goethe House), and two major botanical gardens, the Palmengarten, which is Germany’s largest, and the Botanical Garden of the Goethe University. Frankfurt is situated at the heart of Europe in the centre of Germany. It has outstanding transport connections with an international airport, the major intercity rail station and the Frankfurt autobahn intersection. And it’s not just travelling to Frankfurt that’s so straightforward – thanks to their location in the city, the Maritim Hotel is also quick and easy to access. For instance. It is just a 10-minute walk from Frankfurt central station. The journey from the airport to the centre of town by car or public transport takes about 15 minutes. The outstanding “S-Bahn” suburban and “U-Bahn” underground railway networks provide an effective inner city transport infrastructure and rapid connection to the surrounding area. More than 1,700 taxis operate in the city every day. In addition, the Frankfurt bus route network covers the complete city and uses hybrid buses. The Maritim Hotel Frankfurt is linked directly with the trade fair and the Congress Centre. Its central location makes the hotel an ideal starting point for every travel destination. The motorways A5 and A3 are just a few minutes away. For the Maritim Hotel please follow Messe Frankfurt that is well signposted on all access roads. Please note that an environmental badge is obligatory for green zones in Germany, also for foreigners! Purchase your badge prior to your visit to Germany! Vehicles without environmental badge may not pass through the green zone, otherwise a penalty of 40 € and a penalty point in Flensburg impend. This is also valid for all vehicles registered in foreign countries, like cars, trucks, and busses, as well as for business travelers and for tourists. For this reason it is recommended, that all drivers seek further information about the environmental badges well in advance, and purchase it on time. Participants will be given their name badges at the registration desk. Due to security regulations, all participants must wear their badges throughout the conference. Only participants with white badges will be admitted to the sessions. Copyright of the International Consensus Conference On Patient Blood Management is owned by the European Blood Alliance (EBA). EBA reserves the rights to all recordings, reproductions or presentations at this conference. Any photography, filming, taping, recording or reproduction in any medium of any of the programme parts of the conference without the express written consent of EBA is strictly forbidden. It is recommended that participants obtain adequate cover for travel, health and accident insurance before they depart from their countries. MCI Amsterdam as the Conference Secretariat and International Consensus Conference on Patient Blood Management claim no liability for the act of any supplier to this meeting, nor liability for: personal injury, the safety of any attendee while in transit to or from this event, for any loss or damage, for delays in transport by air, sea, rail, road, weather, in case of strikes, sickness, war or other causes. Please visit the website of the German government, to verify whether you need a visa to enter the Germany. If you do need a visa, please apply as early as possible, as the process can take up to six (6) weeks. To assist you with the application, you can request a visa invitation letter during the online registration process. This invitation letter will be sent to you by e-mail (PDF) after receiving your registration payment. Your registration payment is one of the main requirements of the application.